When looking online for critic quotes for my essay I found these two resources really helpful as there is so much there! The novel ‘Birdsong’ by Sebastian Faulks focuses on WW1 and its effect on society through the journey of the protagonist Stephen Wraysford and his family. The novel is structured around three time periods and Faulks uses these time changes and the characters in each to show the differences that the war made. The first section is set in France before the war and introduces Stephen and his affair with Isabelle. This whole section shows how little rights women had, especially shown in Isabelle’s unhappy and abusive marriage to Azaire. The next section contains the war and explores trench warfare, tunnelling and going over the top. The final section is set in 1970s Britain and concerns Stephen’s granddaughter Elizabeth who is researching WW1. This last section truly shows the change in society and women’s rights as Elizabeth is free to have a child despite being single. The novel opens with a lush and Romantic description of Amiens and the “river Somme”, showing the nature that will soon be destroyed by the war. Faulks describes passages and tunnels multiple times in the opening paragraphs, giving the ideas of the tunnels of WW1 from the very beginning, “the river Somme broke into small canals”, “unregarded passageways”. It could be argued that Faulks does this to show how the actions of the society in “France 1910” caused the war. The natural elements of the description give ideas of the Garden of Eden, and thus you could see the war as symbolising the fall of man. Houses are often used as outward manifestations of the family that lives within them in literature and the Azaire house in Birdsong is no different. The house is described in a gothic manner as having a “strong, formal front” with “iron railings”, this sturdy exterior shows that the family is respectable however the iron railings could be seen as a metaphor for Azaire trapping Isabelle within and seeing her as a possession. Isabelle is an obviously beautiful trophy wife, her beauty not shown through her husband’s admiration but Stephen’s curious thoughts about her, “her white hands”, “membrane of her lower lip”. Isabelle is a commodity to Azaire, her marriage was “sold” to Azaire by her “father” and he objectifies her, choosing to “display her to his friends”. This shows the patriarchal nature and capitalist views of Victorian society. Azaire is not only an abusive husband but an exploitative business owner, representing the capitalist businessmen who contributed to causing WW1. We can see a socialist point of view in the character of Meyraux who plainly describes the problem with society in his argument with Azaire, “What the industry needs is… a less mean and timid attitude on the part of the owners.” Faulks links capitalism to war by having Azaire talk about his workforce using the semantic field of war, “we need to retrench”. In both war and industry the men are used merely as pawns to advantage those higher up in society. Stephen doesn’t see war like the officials do, he almost poses as the voice of reason, “Every one of the men we’ve killed is someone’s son”. Faulks uses him to voice the views of many soldiers, including Wilfred Owen, “No one in England knows what this is like”. That thought is a theme of the whole novel, confirmed through Elizabeth’s naivety about the casualties of the war in the 1970s. The only outcome of war is the questioning of morality, which is exactly what Stephen does when talking to Wraysford, he expresses his newly damaged mindset weaved with both his opinion and societal opinions of war, “This is not a war, this is an exploration of how far men can be degraded”. He even speaks the truth when talking to his hopelessly optimistic superiors who believe that the battle will be “over at dawn”, Stephen thinks logically and questions both the “terrain” and the actions of the “enemy”. When the soldiers wait for the command Faulks uses short sentences and phrases, “They were almost there. Stephen on his knees, some men taking photographs from their pockets, kissing the faces of their wives and children. Hunt telling foul jokes.” This slows down time and shows the panic of the anticipation. He uses short sentences again in the battle itself, this time to speed the action up, “It had not been cut.” Faulks personifies nature, “soil spat”, suggesting that nature is fighting back and joining the battle, a similar idea to those in “Futility”. The dehumanisation of soldiers is shown very specifically in the battle as the soldiers are described as “primitive dolls” and “humps of khaki”, giving the impression that they are less than human, dispensable. Faulks uses several semantic fields in the battle, this mix of semantic fields adds to the eclectic and crazed nature of the war. He uses the semantic field of machinery, “clog the progress”; horror, “his nose dangled”; and when Stephen survives the Romantic field of nature, “There are trees beyond the noise, and down in the valley is the fish-filled river.” Faulks later mixes the semantic field of butchery, “pink skin” “small joints of meat” with the semantic field of drowning, “wave breaking” “undertow of fear”. The semantic field of butchery makes the reader see that the soldiers were treated like animals, simply dying for a higher purpose. The semantic field of drowning insinuates that either the men were drowning in the noise of the war “sound of shellfire” “explosion”, or even that they were drowning in the bodies, unable to dispose of them all. The sections set after the war concern Elizabeth, Stephen’s granddaughter who is both coping with being pregnant with a married man and searching for her grandfather’s story. Part 3 unsurprisingly starts in the “tunnel of the underground”. The motif of introducing each timeframe using tunnels links all three, showing how the war affected all. Elizabeth visits France to try and find out what the war is like and is surprised by the scale and horror of it all, the “endless writing as though the surface of the sky had been papered in footnotes”. That image gives the reader an insight into Elizabeth’s head and the unfathomable number of names on the memorial. Because the reader has just got a taste of WW1 through ‘Part 2’ we sympathise with Elizabeth, however the tone of these sections seems ironic because we know we’ll never experience it like the soldiers did, which is why “My God, nobody told me” rings true with the readers. Elizabeth gets impregnated by a married man, and the fact that she can do so and have the baby shows how the world has changed. Before the war this would be frowned upon by Victorian society but not even her mother minds now. The only one who’s unsure is Robert, her lover, and the novel ends with him finally accepting the thought of another baby and being overwhelmed with “great happiness”. A feminist reader would be glad of this ending as it truly shows that despite the deaths caused by World War 1 it propelled society into the future and promoted freedom. Faulks shows in this final section what the men in WW1 fought for, not for patriotic values or revenge but for the future. WW1 Poetry as a Genre? Sorry for the lack of posts over the last week! I have been writing blogs however my internet connection on holiday down south wasn’t letting me upload things *shakes fist* – so unfortunately you’ll probably now get quite a few blogs over this weekend!! Lets begin with discussing whether WW1 poetry is it’s own genre! 1) The change in attitudes to war (i.e. soldiers are heroes and war is something to be ashamed of) pretty much stay the same! 2) The range of poetry is so diverse it was hard to find a good example to represent them all! 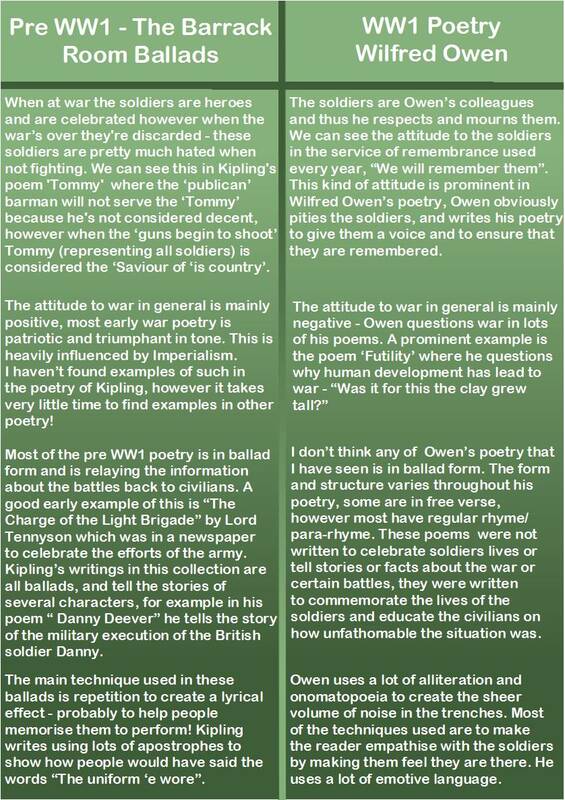 I’ve chosen to compare Wilfred Owen’s WW1 poetry to Rudyard Kipling’s ‘Barrack-Room Ballads’ from the late 1800s. As we can see the techniques and attitudes are very different from before and after WW1, however most war poetry after WW1 has the same attitude and similar techniques to the poetry from WW1 (despite changes over the years due to styles of writing changing!) – so I would say that WW1 poetry is a transitional genre of war poetry that has educated and inspired future war poets on what war is like. 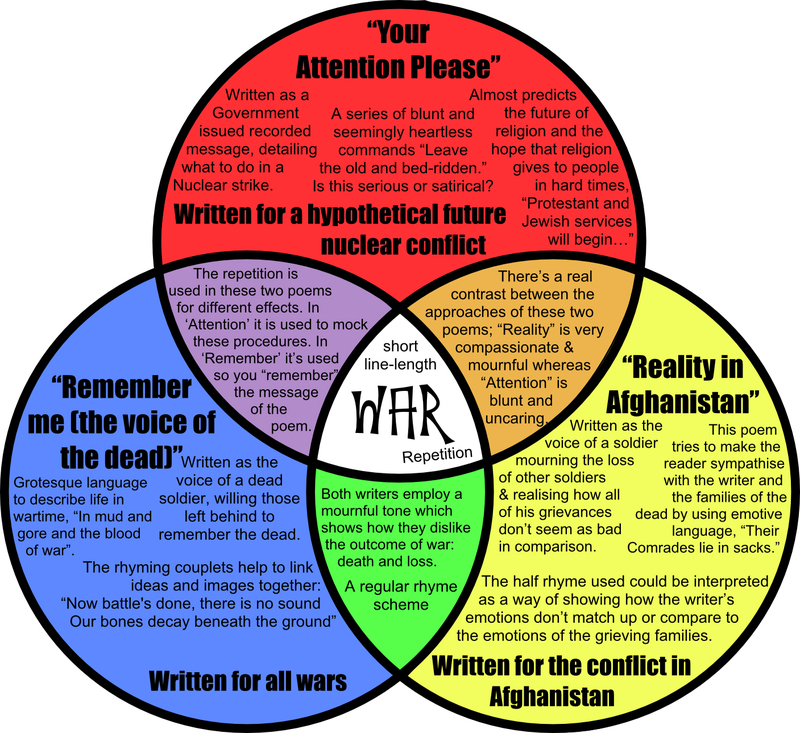 I found this a really useful way to compare and contrast poems centred around different conflicts and wars! Unlike the wisps of smoke from chimneys in our pleasant land. Knee deep in the mud of the trenches we prepare to fight and fire. At home we plough and reap and the harvest fills our hands. Yet here our hands and flesh are also caked in blood. The land almost looking like the ploughed soil of the farm. To waste a single bullet and hope out of it comes harm. And out of the trenches come the Tommies, the infantry arise. The shells send soil flying and flailing limbs fall flat. And in the trenches blood pumps round bodies entering combat. Is this what life has come to, the rapid progression of man? These piles of men are sacrifices for several feet of land. One of our tasks in English over the summer was to write a war poem and this is the result! Thanks for reading and feedback is appreciated! The similar themes and devices of Michael Morpurgo (in the film adaptation of ‘Private Peaceful’) & Wilfred Owen’s poetry. In ‘Private Peaceful’ we can see the main characters experience a loss of faith, Tommo near the beginning when in the prison cell says “Why does this war happen”, he also feels bitter because his father died and he feels that if God was just he wouldn’t have allowed that to happen. Wilfred Owen in his poem ‘Futility’ demonstrates the loss of faith that the soldiers experienced by mixing the vocabulary of religion and evolution, “was it for this the clay grew tall”. We can also see in ‘Private Peaceful the futility of war by the spoken line “All that fighting, no gain on either side”, showing how lots of death resulted in no progress. In the poem we can see that the soldiers are mainly farmers, “whispering of fields unsown”, which makes the fact that nature is fighting back even more poignant, showing how far these people have gone. In the film we can see that the brothers are farmers, and how when they go to war they still talk about their farming (for example when at the French pub). In the film we get visual context in terms of the struggle for gas masks and how people reacted to the gas. In one scene the soldiers were warned of a gas attack and we could see how they fumbled to put their gas masks on and how some choked and struggled to breathe while putting them on. In ‘Private Peaceful’ the young men are persuaded to go to war by a sergeant or officer who says “Girls love a soldier”; we can see that they are tempting the men into the army by telling them that they’ll be more attractive when returning from war. However we can see Molly disapproves of Charlie going to war, showing how women didn’t want their husbands to leave them and their children. Wilfred Owen in his poem ‘Disabled’ also contains a character who believes that going to war will make him more attractive, “and maybe too, to please his Meg.” Owen expands on this by later talking about how the only women this young boy will ever encounter now are nurses who won’t glance twice at him “Tonight he noticed how the women’s eyes Passed from him to the strong men that were whole”. We can visualise such events in the poems by looking at scenes in the film, especially those in medical tents, with nurses tending patients. Another theme in the film is that of young boys lying about their age to get into the army (and thus achieve such success with women). We can see this in the character Tommo who lies about his age to apply for the army, mainly because Charlie has gone off with Molly. In ‘Disabled’ we see this when the young boy tells the army that he is 19 “Smiling they wrote his lie: aged nineteen years.” By showing this we can see how desperate the army were for volunteers.